Tufcoat provides a shrink wrap installation service using our experienced teams, supported by onsite supervisors and a key account manager. This network ensures that communication throughout the project is clearly delivered both onsite and to customers offsite. 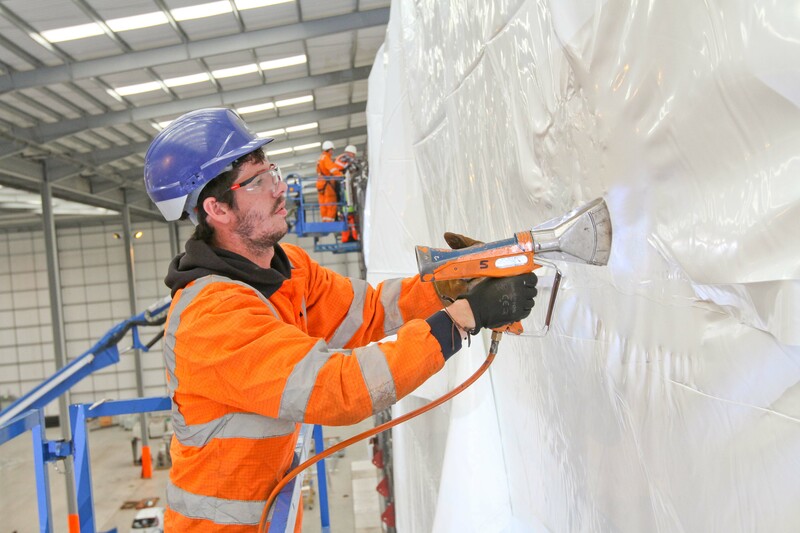 Tufcoat is a leading specialist in shrink wrap installations; for ten years our teams have worked on a diverse range of projects in the construction, industrial and marine sectors, giving us a wealth of experience, meaning we can deliver a quality a installation service every time. Our shrink wrap installation service is supported by a dedicated installation manager, responsible for delivering specific risk assessments, method statements and final handover documents to sign off of the installation, meaning you can have the peace of mind that your project is in capable hands at every stage of the process. We have a number of teams based around the country covering all areas of the UK and can offer our services internationally upon request. Our installation teams have been trained to meet the high standards of practice we expect. This ensures each installer is fully competent with the installation practices and safety requirements for any project that arises. As well as shrink wrap application, we can provide extensive advice and support throughout the project. Our installations manager can make recommendations about the products and processes most suitable, based on the project details supplied to us during quotation. If you are interested in a shrink wrap installation for your project, get in touch.